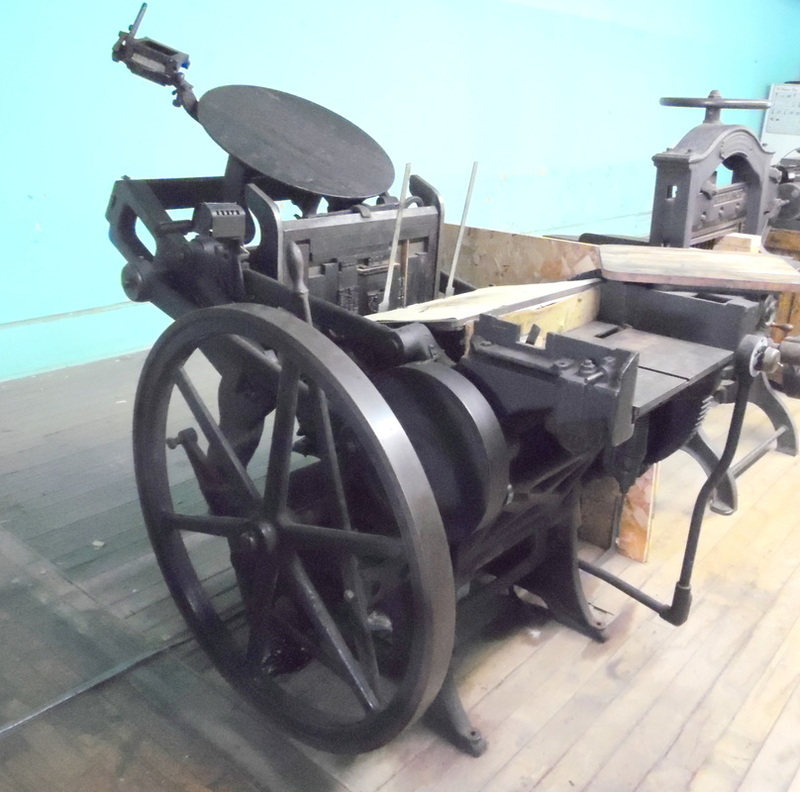 We have two platen presses, which are a type of press used for small job printing. Their age? No one has figured that out yet. An 1886 article in the Atchison (Kansas) Champion offers a tidbit upon which happy speculation may sieze. It refers to a Gordon press in a printing office that is for sale. The office was located at the junction of the Atchison & Nebraska Railroad and the Republican Valley Railroad. That’s Table Rock. Curiously, the office advertised in the Atchison Champion was touted as having been established six years earlier, putting it back to 1880. The Argus was not established until 1882. The printing office for sale is not identified as a newspaper office let alone as the Argus. The person to whom inquiries were to be directed was Hassler of Table Rock. Was he connected to the Argus? No one knows, because there are no surviving editions between 1883 and 1890. The first surviving editions of the Argus, form the summer of 1882, show the proprietors to be William H. Ketchum, Editor and Proprietor; M. H. Marble, Associate Editor; and W. H. Harrison, Business Manager. The November 4, 1882 edition stated without explanation, “Harrison and Jones, Publishers.” No editor, associate editor, business manager, just “publishers.” The few surviving editions of 1883 continue the recitation, and then there is a gap until October 20, 1890. By that time Frank H. Taylor had bought the paper. What does all of this come down to? Speculation. 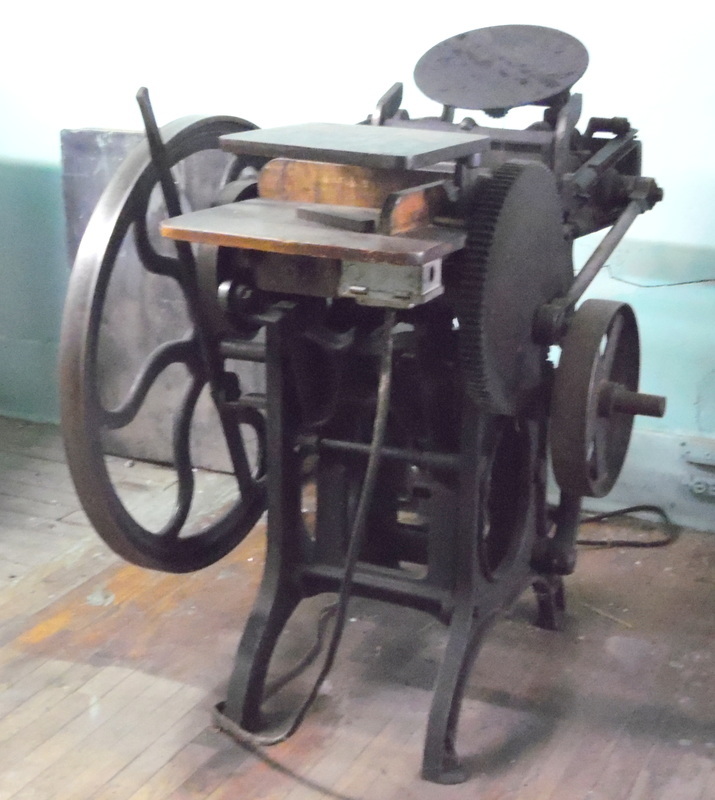 Perhaps a printing office went up for sale and the platen press was bought by the Argus. Perhaps this information may come in handy when someone -- perhaps the reader of this note -- wants it! Above & below -- Our platen presses, in photos taken just before the renovation of the museum was begun in the Spring of 2015. Below, a Gordon platen press in operation. Note that it is operated by belt. Ours were too, originally, but motors were added at some point.